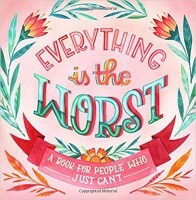 If you’re one of the many people that adored the sarcastic “It’s Just Not Your Day” calendar, illustrated by Anni Betts and then you’ll be happy to hear that the good people at Workman Publishing are finally releasing the long-awaited book, “Everything is the Worst: A Book for People Who Just Can’t”. Just like the calendar, the book is filled with decorative lettering of both old and new sarcastic sentiments, all illustrated by Anni in a style that’s usually made for cheerful motivational quotes. In other words: a great gift for your fed-up coworker or frustrated family member!